Many Linux snobs push the Arch operating system as the greatest thing since sliced bread. In fact, some members of the Arch community (not all of them) can be downright mean and unpleasant to non-users. Not using Arch? Ugh. Peasant! In reality, while Arch is a fine OS (stable and fast), it can be very hard to install and set up, and quite frankly, often not worth the hassle. People have lives to live, and sometimes it is easy to forget that an operating system and associated computer are tools -- not a religion. But OK, if you want the benefits of Arch without the tedious setup process, there are Linux distributions that can help. One such operating system that I love is Manjaro. The OS is excellent, and you can tell the developers truly care about the user experience. Its wonderful Calamares installer makes everything a breeze. Today, version 17.0.2 becomes available with three of the best desktop environments -- GNOME, KDE, and Xfce. 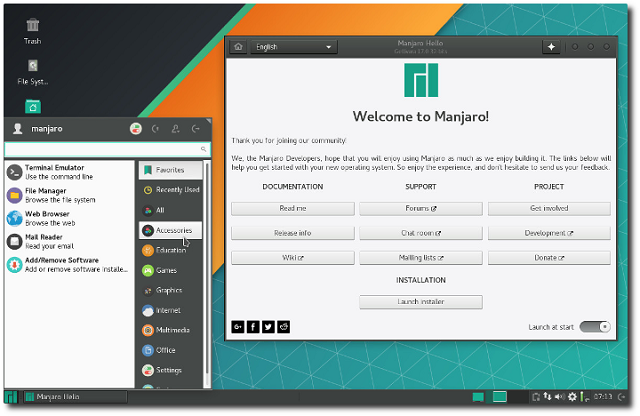 "Manjaro Gellivara was a great release! Now we are proud to announce v17.0.2, which fixes a lot of issues we had with our original release of Gellivara. It took us almost three months to finish this updated version. We improved our hardware detection, renewed our installer (Calamares), added the latest packages available to our install media and polished our release as a whole," says Philip Müller, Manjaro Development Team. Müller shares the following significant feature updates. While installing Manjaro effectively gives you an Arch base, don't expect "true" Arch users to give you any respect or support -- you will still be looked at as an outsider by many (again, not all) in that semi-toxic community. You know what? Don't worry about that. Just enjoy using the fast and stable operating system that you installed without grief. Ready to download? You can get the ISO here. While I am a fan of GNOME, both KDE and Xfce are good choices too. If your computer has meager specifications, I would suggest Xfce, as it is the most lightweight desktop environment of the three.